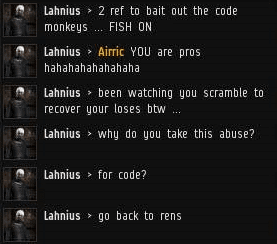 Previously, on MinerBumping... Anti-Code rebel Lahnius terrorized the Nakugard system by spewing endless nonsense in local chat. Or, at least, he thought he was terrorizing people. In fact, the citizens of Nakugard stopped responding to Lahnius. The self-proclaimed "agent of chaos" wallowed in loneliness--and the sound of his own voice. 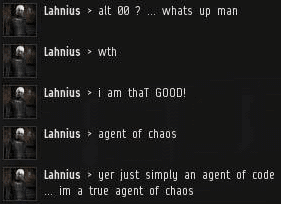 Time and time again, Lahnius attempted to elicit a reaction from his nemesis, Agent Alt 00. She ignored him and went about her work, enforcing the Code and killing non-compliant miners. When Lahnius ran out of material, he went up and down the list of names in local. He hated them all. ...But even he grew tired of listening to himself. 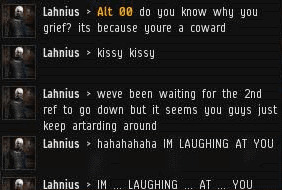 Since no one would engage with him, Lahnius declared victory. It was all part of a brilliant plan. Getting everyone to ignore him was his masterstroke. 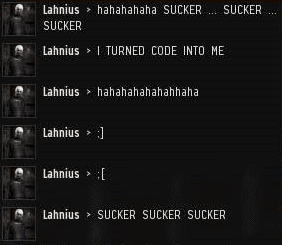 For weeks, Lahnius had tried to figure out a way to destroy the mighty CODE. alliance. Now he'd done it. All he had to do was make a fool of himself in Nakugard local for hours on end. It was so simple! Every once in a long while, another person would actually say something in local. Invariably, their words made Lahnius irritated and angry. Of course a random passerby wouldn't be able to understand his genius. 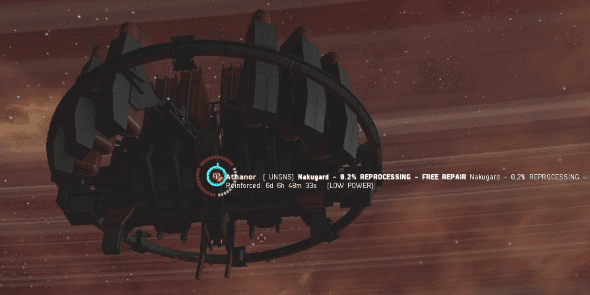 Though he dominated local chat, events passed as normal in Nakugard: The New Order grew more powerful and more miners surrendered to the Code. The only people capable of mining were those who had permits. Lahnius cursed them. 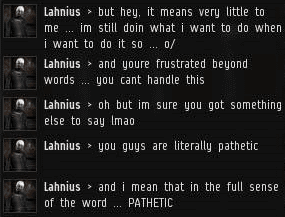 Alone in his corner, Lahnius tried to encourage himself. He had made an impact, he told himself. He'd changed Nakugard. Then there were the refineries. If CODE. engineered their destruction, it would only prove how much he'd gotten to them. Losing all his stuff would be his final revenge. Lahnius' howling madness was a fact of life in Nakugard. Many residents learned how to use the "block" function for the first time. 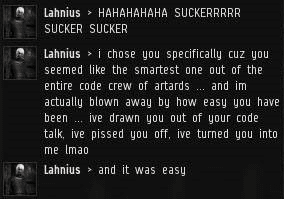 Alas, Lahnius' reign of chaos could not last forever. One of his two remaining refineries, located in another system, had already been destroyed. 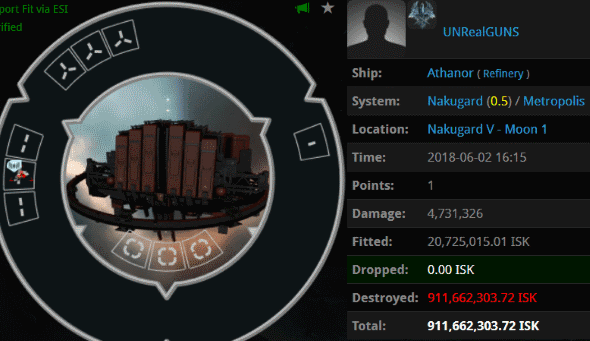 Now his final possession, a refinery in Nakugard itself, was under attack. 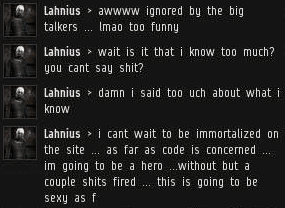 Lahnius was there to watch it burn. 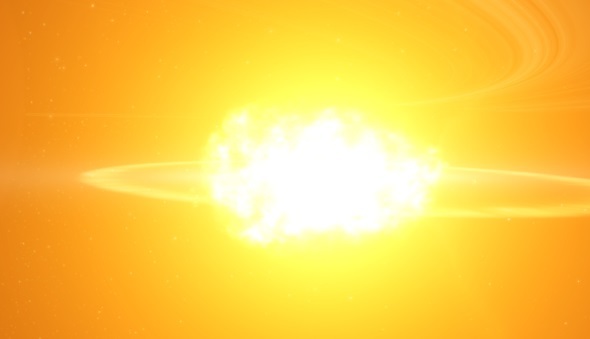 With a fantastic explosion, the Nakugard refinery was no more. 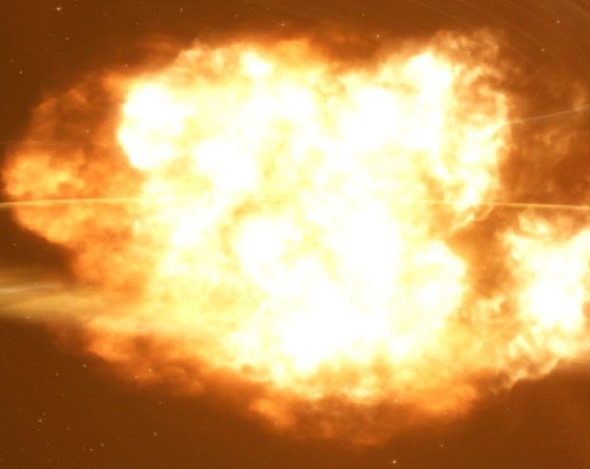 The Marmite Collective wardecced Lahnius' corp and sent one of their fleets to blow it up. Pictured above, the wardec system working as intended. Lahnius vowed to fight on, but without even a refinery to his name, he realized he had no legacy. He had nothing left to fight for. 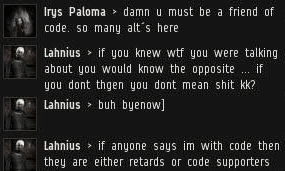 Lahnius and his alts left EVE Online. They have not been seen since. There was no more chaos in Nakugard. The sole proof in Nakugard that Lahnius ever existed: A simple container. Just a hollow shell, like the man who anchored it there. There was madness, followed by an everlasting silence. Such is the fate of all who would oppose the Code. Sometimes the pen is mightier than the sword. Please tell me this guy does not have children or a firarms licence? Pray that he has not already polluted the gene pool with mini-shitters. I'm not a violent person, but while he droned on and on I was having fantasies about shoving a pencil in his ear. p.s. do you think alt 00 will ever explain how she does the agress/warp trick in highsec? Asking for a cooked friend, bro. Yes, yes it does look like you GAF, seeing as how you took the time to reply like a petulant adolescent. Not to mention 'made you register'. You seem mad and ignorant, much like your carebear miner friends. Birds of a feather and all. Hell, you're almost a shardani level joke at this point. All your null "friends" laugh at you, daily. 24 parts and it's over? I was under the impression that he haunts Nakguard, still raving for an eternity. 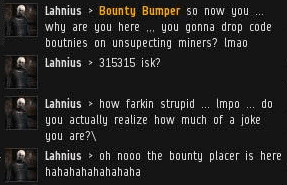 I almost felt sorry for the miner at the end. The end of a 24-part Opus. A Code-defying miner's descent into madness. What a ride it was. I'm telling ya, that shitter is an alt. Has to be. No one is that stupid in RL. It was fun to read anyway! 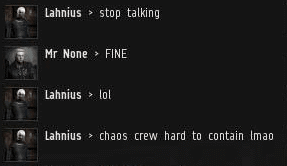 Highsec shitter meltdown best meltdown! "Immortalised" is not wrong. What a fascinating series. 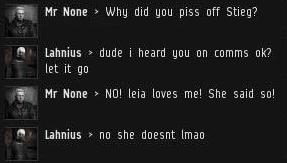 That guy is mad as a cut snake and I get the feeling RL Mrs Lahnius is a bit of a nutter too. Did anyone else suspect Mrs Lahnius was the author of some of the strange ramblings in local? Not in this one but at least one of the previous episodes. You could feel a slight shift to the structure in language to that of Mrs Lahnius shoving him out of the way saying, "Hold my beer. I wanna say something...". I hope he/they get some professional help and maybe stick to solo player games that don't illicit so much of an emotional impact. This should be the plot of EVE: THE MOVIE.